Now you can hand wash your clothes without getting your hands wet. Introducing a new way to get your laundry clean that requires zero electricity, as well as less water and detergent than traditional machines. It’s called The Laundry POD and it's engineered to fit under the sink and into your life. 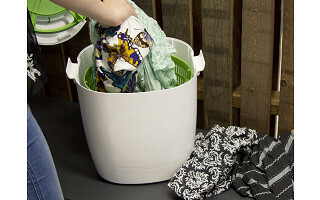 This portable, environmentally friendly washtub works like a salad spinner—only it’s for clothes. Convenient for tight spaces like dorm rooms and city apartments, the Laundry POD lets you do a small load of wash quickly, quietly, and energy efficiently. When you’re done for the day, just pack it away. Hi Everyone! 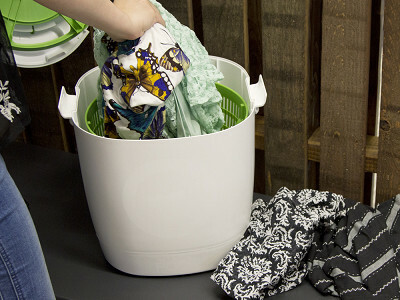 Save money, save time and clean your small loads and delicates more efficiently with The Laundry POD. Simple to use, and easy to store - The Laundry POD is perfect for apartments, dorms, RVs, Boats or even Camping in the great outdoors. Portable and eco-friendly, The Laundry POD is a hand-crank washer that uses less than 5 gallons of water per wash, and Zero electricity. Have you tested this with cloth diapers? This is a great question. I think that Rachel will be the best person to answer this and will let her chime in shortly. Thanks again. @Amy That's a great question. Until we test this, we cannot recommend it for that use. Luckily, one of the employees here is expecting a baby within the next week and he has volunteered to test it for us. We will keep you posted on the results. Sorry, but a few mesh bags are a lot less expensive and allow me to put my delicates in with any permanent press or delicate load, I'm not using any extra water or power, and don't have yet another gadget to store somewhere. I put my delicates in the dryer with the rest of the load but take them out after a few minutes to get the wrinkles out and then hang them to dry. @Andrea You're right about mesh bags and delicate cycles but - there are many city dwellers who do not have access to laundry in building and find that it's helpful to be able to do small loads without having to walk up/downstairs and blocks away to the laundromat. I live in a third-floor walkup myself so I love having an alternative to my laundromat (which often closes before I get home from work!). The Laundry POD is also great for RVing or camping and for taking places where you can't have a conventional washing machine. I purchased a similar gizmo from ebay about two years ago. I had to empty the device in order to rinse. Does yours work similarly? Unfortunately, the one I purchased was ineffective at spinning the water out. Does yours work more efficiently at this process? Thanks - your question will not go unanswered. I've asked Rachel this question about emptying to rinse and we will get back to you shortly. 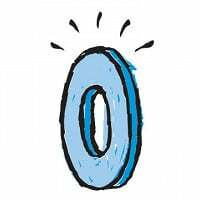 We've had several testers and they have all praised the efficiency of this Grommet. Two years ago, I lived in an apartment that didn't have laundry facilities. I had to go to a laundromat two miles away to do laundry, and I had my clothes from my laundry stolen once. I started washing my clothes by hand, then I discovered that I could do the task more efficiently in my salad spinner. I now live in a house with a washer and dryer, but I would consider buying a POD to save energy and water. If I can wash clothes in a salad spinner, I am sure that I can wash clothes in a POD! Yes, Amy and a POD would be even more efficient than the salad spinner - can't wait for you to try it out. Now you can hand wash your clothes without getting your hands wet. Introducing a new way to get your laundry clean that requires zero electricity, as well as less water and detergent than traditional machines. It’s called The Laundry POD and it's engineered to fit under the sink and into your life.